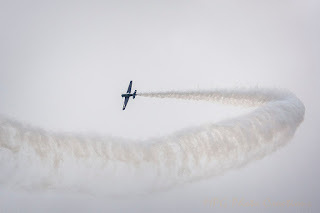 My image today is from the Great Bend Air Show I went to this year. This is a Navy SNJ which was a WWII training aircraft and exactly like the Army Air Corp T6 Texan I was able to fly in a few years back, just different paint schemes and designations. Here it was performing some stunt flying with smoke. I liked how the smoke trail was captured in this image.